Bot flies are true flies (Diptera) from the family Oestridae. 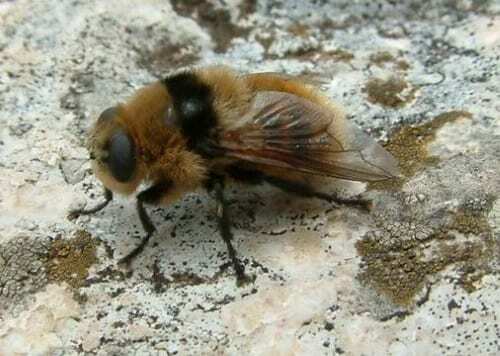 As adults they are rather attractive, resembling fluffy bumble bees, but bot fly larvae (maggots) are parasites growing in the skin or digestive tracts of mammals. The lifecycles of different bot fly species vary, but these specimens are from the genus Gasterophilus, which are all parasites in the digestive tract of horses and similar animals. The adult females lay eggs on a horse’s coat, which the horse licks up as it cleans itself. The larvae then grow and develop, first in the horse’s mouth and then in its stomach, absorbing all the nutrients they need. 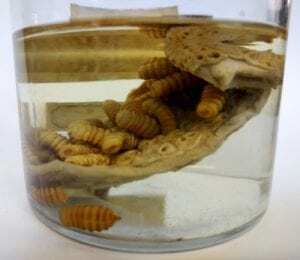 This is such a good way for the larvae to feed that the adult flies never need to eat at all. When the larvae are ready to pupate they travel the rest of the way through the horse’s intestines and out in its droppings, ready to emerge as adults a few week later to start the cycle again. 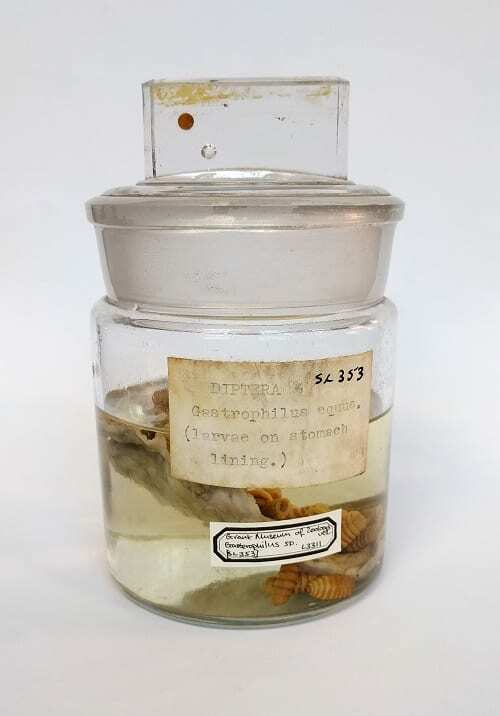 This week’s specimen is actually made up of lots of individual bot fly larva and part of the stomach they were living in, so there are two species here. Each species of bot fly has a different life cycle and infects a different range of hosts. Some species of bot fly are very specific in their tastes, for example Gyrostigma rhinocerontis only parasitises white and black rhinos, and as rhinoceros numbers have declined this fly has become endangered too. There are around 150 species of bot fly worldwide, nine of which can be found in the UK. Many species of bot flies are important to humans as they attack domestic animals such as sheep, cows, horses and reindeer. A heavy infestation of maggots can make animals unwell and lead to complications like stomach ulcers, and may eventually kill the host. Some species attack humans too, such as the human bot fly Dermatobia hominis which is transmitted by mosquitoes and grows under the skin of its host. Fortunately the bot flies don’t get everything their own way. Reindeer bot flies are a traditional food in some caribou-hunting communities in Canada, and there are many examples of Palaeolithic art that seem to show bot fly larvae, suggesting they were a favourite snack in Stone Age Europe too. Yum.